One of the most common household bug infestation problems is the cockroach. Cockroaches hide in small nooks and crannies. An infestation of cockroaches can be dealt with, but it is first necessary to identify the kind of cockroaches living in your home. Many people don’t know that there are actually 5 different types of cockroaches that are categorized as pests. Knowing how to identify a cockroach will make treating the problem much easier. 1. Count the six legs of the specimen – a cockroach has 6 legs. Check to see if your specimen has a hard exoskeleton. Look for thin, transparent wings. Thin, transparent wings belong to a cockroach while hard, opaque wings belong to a beetle. Do note, however, that cockroaches that are not yet fully mature will not have wings. Observe the long, flat, wide body of the insect. All cockroaches have a long, flat, and wide body. Look for a set of long antennae on the front of his head. Look at the brown or black color of the cockroach. German cockroaches and American cockroaches both have a reddish brown color. Oriental cockroaches have a black, shiny color. Brown banded cockroaches and a smoky brown cockroach, on the other hand, have a very dark brown color. Measure the cockroach by placing the specimen on a piece of white paper in front of a ruler. If it is between 1.5 to 2 inches (3.8 to 5.0 cm) in length it is probably an American cockroach, the largest of the 5 pestilent cockroaches. If it is just slightly smaller, it is probably a smoky brown cockroach. Oriental cockroaches are about 1.2 inches (3.0 cm) in length with short, unusable wings. German cockroaches are small, only approximately 0.5 inches (1.3 cm) in length. Look for any additional markings like stripes or color changes on the body of the cockroach. German cockroaches have 2 black stripes right behind it’s head, and brown banded cockroaches have light brown lines wrapping around it’s abdomen. Electronic pest control is the name given to the use of any of the several types of electrically powered devices designed to repel or eliminate pests, usually rodents or insects. Bed bug infestations that have skin crawling across North America haven’t spared London, where the city-run public housing agency’s pest-control budget has increased 10-fold. Now that’s a pricey pest. In recent years, the housing body — which provides subsidized public housing in London and Middlesex County — spent about $20,000 a year fighting pests. Now? The tab has hit $200,000, almost all of it going to pay exterminators to battle bed bugs. And Grater says he’d like to add $186,000 to hire two people to handle the infestations, though he expects that will be delayed at least a year. The problem appears to have spread far beyond public housing in London. Here are some quick tips to make sure your room (hotel rooms, bedrooms, living areas, etc) isn’t infested with bedbugs! Most people who end up having their home infested with bedbugs could have prevented it by looking for the signs below. If you have bedbugs (rather than looking for them), then check out our Bed Bug Treatment page. The first thing you can do is find reviews of the hotel you’re staying at by searching the internet. We can do that for you if you prefer, simply leave a comment asking us to check your hotel [include the name and address of the hotel in your comment] and we’ll post the results under your comment. Keep in mind that a report about one hotel does not mean the issue wasn’t isolated to one room, or that hotel management hasn’t since exterminated the bugs. When staying at a hotel, hang clothing in the closet that is farthest from your bed, place luggage on the folding rack usually found at hotels and always place your luggage in a plastic bag (hotel provided dry cleaning bags work great). When you inspect a room for bedbugs, make sure you wear disposable medical gloves! Bedbugs gorge on the blood of humans, so much so that they can easily pop with very little pressure. When a bedbug pops, it will splatter blood and you may be exposed! Picture of Bed Bugs, their eggs, shells and feces! 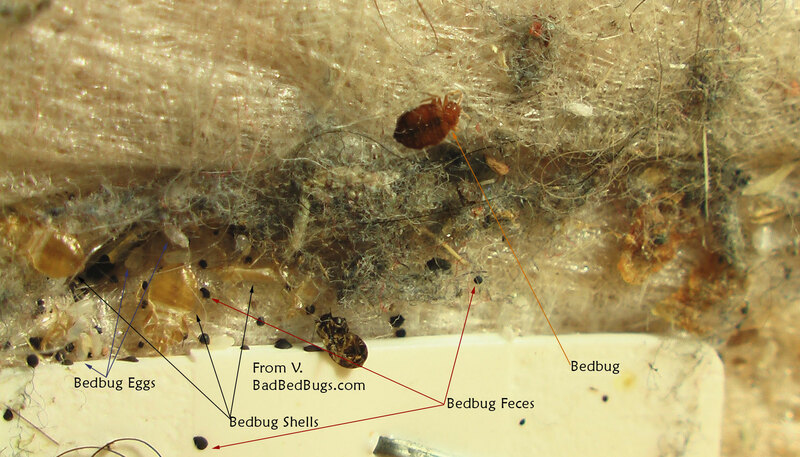 This is a high resolution photo of what a bed bug infested mattress looks like including their shells, eggs and feces. You can zoom in on the picture if you need to. After you arrive at your hotel, the first thing you should do is to spot check the bed. Peel back the bed sheets and check the mattress, running your fingers along the upper and lower seams. Make sure to check the mattress tag and plastic around the edges (see the picture above); bed bugs often hide there.